Annual Conference – NYSACRA’s annual conference is a prestigious event that includes over 50 topical sessions provided by professionals to professionals in the field of developmental disabilities. Individuals with disabilities are honored through participation in art exhibits and theatre productions. The annual conference also provides the venue for an election of NYSACRA board members and their introduction to the membership at the Annual Banquet Dinner. Leadership Conference – NYSACRA convenes an annual leadership conference designed for upper-level administrators on topics that are crucial for continued success. Regional Direct Support Conferences – NYSACRA’s regional conferences provide direct support professionals an opportunity to acquire new skills, network and be recognized for the excellent work they perform. Timely Topics – NYSACRA also presents conferences on other topics (such as Medicaid, diversity, and person-centered planning) that respond to membership needs. Management Development Series – NYSACRA presents regional training throughout the year to enhance subjects from the Annual Conference and introduce new topics. Legislative Day – NYSACRA members converge each winter on the State Legislature to educate elected officials on the impact of the proposed budget and the importance of policy issues for the individuals we serve as part of our annual Legislative Day. Online Action Center – NYSACRA’s new Action & Education Center, presented on our website, provides members with all the tools they need to achieve grassroots success. The center includes links and information on elections, voting, media contacts in the state, action alerts, legislation, and other issues all by simply entering a zip code. Legislative Guide – NYSACRA’s Legislative Guide provides step-by-step guidance on grassroots advocacy, writing and visiting your Legislator and the NYS Legislative & Budget process. Workforce Guide – NYSACRA’s Direct Support Workforce Guide, an initiative of our Workforce Committee, provides information on the continuing crisis in recruitment and retention of direct support professionals, with easy, accessible and important facts about our direct support professionals so those not familiar with our industry can begin to understand the crisis facing our workforce. Economic Value Study of Community Group Homes – This Statewide study proves that community residential programs for the developmentally disabled not only provide a needed service but are also a major economic contributor to the local community, i.e., providing jobs and buying goods and services locally. Timely Publications – NYSACRA News & Views provides weekly news updates and NetWork News is our quarterly newsletter with more in-depth coverage and agency profiles. 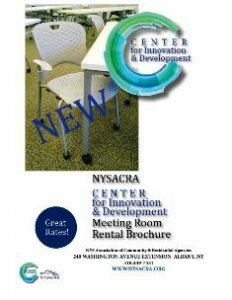 Other Research – NYSACRA provides Members with extensive research and reports on many hot topics such as Health Insurance, NYS CARES, Recruitment & Retention, NYS OPTS and much more. Integrity and Respect – Be part of an organization with positive ideas, one continually evolving and that takes action on behalf of agencies that serve people with Mr/dd and their families. Networking, Support, and Connections – Be part of a responsive, friendly network to professionally support your work and your agencies work. Contribute yourself. You are not alone. Information – Obtain resources and technical assistance to stay current (and even ahead) through newsletters, email, fax, website, and meetings, regionally and statewide. Ideas – Bring national, state, local and cutting edge solutions and sharing among agencies. Participate in research helpful to our members. Help tackle everyday challenges. Advocacy – Legislative & policy activities that encourage and support people with disabilities in their quest for community and full inclusion. NYSACRA is synonymous with community. Education, Training, and Conferences – The best speakers, the greatest skill building and The Annual Conference of the Year. Knowledge is power. Impact and Voice – Build bridges to government and legislators. Help you develop a quality workforce with tools, resources and special projects. Advance your voice. Help design the future for people with developmental disabilities. Fun and Camaraderie – Humor, relaxation and shared experience at all events. Usually food too. Opportunities and Partnerships – Business connections and product options for agencies are readily available. Obtain grants and develop innovative partnerships.